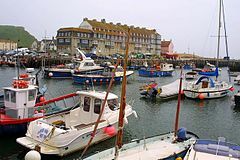 Broadchurch aired as a British Crime drama in the UK in 2013, a labour of love from the creator, Chris Chibnall, who aim was to create a big ensemble drama which concentrated on what happens to a community when a death happens within its midst, particularly when that death is that of a child. Now, I didn’t watch this drama, I’m often slow on the uptake and before I was even aware of it, the show was halfway through, but I know it was big with those millions of viewers avidly discussing the twists and turns. So why did I chose to read the book? Mainly because it is written by one of my favourite authors Erin Kelly but also because a little bit of me felt like I missed out. So this review is probably one of the few you will read that makes no comparison to the series. Set in Dorset the book starts with a brief introduction to the Latimer household along with the introduction to Detective Inspector Alec Hardy who has been relocated for mysterious reasons to Broadchurch where he now holds the position which Ellie Miller had hoped would be hers. With the death of Danny Latimer the whole town suspect each other of the murder while the police battle to find the truth and the media battle to tell the best story. I think this is the first time that I have read a book based on a TV series, it usually works the other way around, and in the early chapters it did feel like a different type of reading experience and I could clearly imagine a silent shoot of a darkened town in the following description. The church on the hill is unlit, the rich jewel colours of its stained-glass windows dulled to a uniform satin black. A weathered poster reading LOVE THY NEIGHBOUR AS THYSELF flaps uselessly from the parish noticeboard. Grief is like a splinter deep into every fingertip; to touch anything is torture. With trade so slow, you’d think she’d be falling over herself to look after the few customers she has. What’s Becca looking at that’s more important than her business? There are so many themes of grief, secrets, love and trust that at times this was an emotional read, I have to confess shedding a few tears at one point which rarely happens when reading and it is even rarer while reading crime fiction. There really is something for everyone in this book as well as a being a big fat juicy whodunit. 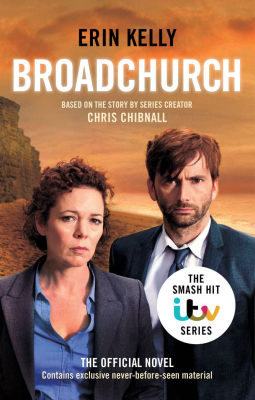 This has my wholehearted recommendation, I will definitely make sure I watch the next series and for those of you who are Broadchurch aficionados apparently there is a clue to the second series early on it this book, I missed it but apparently if you know the show well there is a line that doesn’t fit. I too missed Broadchurch when it aired on TV and unfortunately found out a MASSIVE spoiler online (who did it) so now feel no need to watch it. I may watch the second series though. After reading the book I am determined not to miss season two! I’m very pleased to hear you liked this as much as you did, Cleo. Those atmospheric small-town stories can be so compelling. They’re often about the town and the people in it as much as they are anything else. I did wonder how it would translate ‘backwards’ but not only was the story great, Erin Kelly did a really good job of bringing the characters and their interactions to life. I agree, re the town becoming a character, rather like Rebus’ Edinburgh. When it comes to tv, I don’t know if you watched True Detective, but Louisiana and the bizarreness we were shown became a huge part of the whole series. It seems to be easier to do in rural areas, but I’d love to hear of any urban areas my fellow bloggers and blogging fans think work as characters. (Sorry, I’m such a philistine I can’t think beyond NYC and SATC! But I was a massive fan, as I suspect some of my fellow, probably female, bloggers, were too! So, it is a novelization of the series. I didn’t realize that when I read about it in your Teaser Tuesdays post. Just assumed the series was based on the book (never pays to assume, lol). I’ve read novelizations of tv series before and most have been quite well done with lots of extra tidbits thrown in and wonderful descriptive passages. I haven’t read anything by Erin Kelly, so this is a new author I can look forward to reading. Thanks, Cleo! I missed the start but I read so much praise that I caught up with ITV player and watched avidly till the end. I’ve yet it read the book, but I think Erin Kelly was an excellent choice of author to adapt the material. And I should say that the quality of the series was such that it would stand up even if you knew the story already. Thanks for adding a perspective from watching the series. The quality definitely shone through on every page of this book. Erin Kelly did a fantastic job of adapting the small screen to a book. I loved the read and I am tempted to buy the series just to do a comparison. I’ve read a book by Erin Kelly so I am interested in the book for that reason and for the blurb. It is intriguing that the show came first, hmm. I might be able to get it on Netflix or something to watch, but in the meantime I will look for the book. Thanks! I’ve enjoyed all Erin Kelly’s books although I think The Burning Air is my favourite. I think in some ways it must be harder to write from watching than the other way round. Oh this is interesting! I watched bits of broadchurch but I was more interested in the whodunnit than the community (I know- I totally missed the point). The book sounds great, I think I can enjoy it more now I know who the killer is. I do hope you enjoy it and I’d say the whodunit is a huge point and I’m going to do it the other way round and watch the series now… I tried to resist but I can’t. You’re missing out! 😉 This was so good I’m going to make sure I watch the next series on the strength of it. Well, I was thinking I might see if the series is available online – or possibly buy the DVD. I just can’t keep adding more books!!! Wow. What a read. It’s cool how it was successful going the opposite way from TV to book. The fact that you got emotional says something about it. 🙂 She really managed to bring the characters to life in the book so that their story felt like mine. I watched the TV series, thought it good but slightly over-rated. Normally a book based on a TV series would have me thinking “cash-in” but with Erin Kelly’s name attached it gives the book some real class. My only disappointment is that I clearly remember the storyline and “whodunnit”! I’m sure I would have read this just because it’s written by Erin Kelly but as this is really a whodunit there would be a whole important element missing. I’m sure diehard fans will want to compare and contrast though.